Hungary is a country in Central Europe. Its capital city is Budapest. 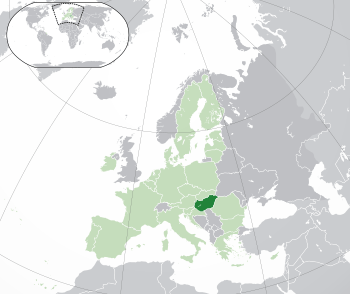 Hungary is slightly bigger than its western neighbour Austria and has about 10 million inhabitants. Other countries that border Hungary are Slovakia, Ukraine, Romania, Serbia, Croatia and Slovenia. Hungary's official language is the Hungarian language. It has been a member of the European Union (EU) since 2004. 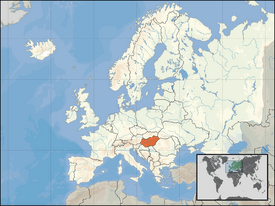 In Hungarian the country is called Magyarország (Hungary) or Magyar Köztársaság (Hungarian Republic). This is named after the Magyar tribes who came to Hungary in the late 9th century. In 1241, the Tatars (Mongols) invaded the country, causing many deaths and damages. In 1301, the Árpád-house died out. Later on, kings from various houses were ruling over Hungary. The greatest of them is Matthias Corvinus, famous for protecting the country against the Ottoman aggression. However, some decades after he had died (1490), the Ottomans defeated the country in the Battle of Mohács (1526). 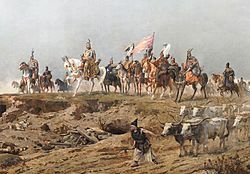 The Kingdom was cut up to three parts: the western and northern areas remained Hungary, the southern region fell under Ottoman rule, and the eastern parts became semi-independent as the Principality of Transylvania. Today, Hungary is a democratic republic. Elections are held in every fourth year. Hungary Facts for Kids. Kiddle Encyclopedia.